Note added on 03/29/11: When Safe Schools Coalition supporters who purchase this film use the partner promotional code, N3GC28, the Coalition will get a much needed 10% rebate. We appreciate your donating to us in this painless way. JOIN US for the Northwest Premiere! by Academy-Award winner Debra Chasnoff. are shaping the lives of American teens. Directions to AMC Pacific Palace are here. 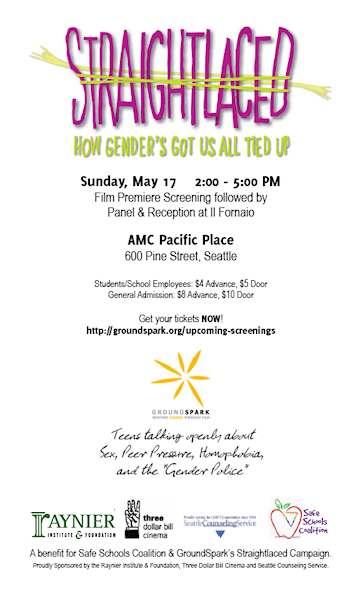 The film proudly showcases the diverse and unscripted voices of more than 50 youth from a wide range of high schools across the country who speak with breathtaking honesty, insight, and humor about gender roles and the struggle to be who they really are. for free to Safe Schools Coalition members to host public screenings in their communities. GroundSpark staff will work with you to host an event that sparks dialogue, raises funds, and inspires your community. To start organizing a screening, contact GroundSpark’s National Outreach Manager, Ryan Schwartz, at rschwartz@groundspark.org.